Are you searching to increase your website loading speed? Images are the main factors which can make your website slower because they take time to load while someone visits your website. Images are heavy in size, I know you are optimizing them using plugins like Smush it, But still, they are heavy in size. As I mentioned above, Images are the heaviest element on a website page which make your page slow. But you can’t ignore using images in the blog post because it is very important to add images from user experience as well as from SEO point of view. Images can drive traffic to your website as well, So there are tons of benefits for using images. Maybe, You are using CloudFlare with your website to increase the loading speed of your website but still, the images are at the same place where they were before. CDN is the best way to make your website fast but they can’t slow the problem of the heavy images. But, how you can solve this problem to make your website faster? This can be solved with Lazy Load, don’t you know about this. Lazy load is the best way which you can use to make your website load faster even you have images on your webpage. Let me make you understand everything about Lazy Load. What Is Lazy Load And How It Works? I am sure that you have seen on many popular blogs that when you are on any post, Images are automatically loaded as you scroll down. This is the what we called Lazy Load. Lazy load doesn’t make your images less in the size and neither decreases the count of images to be shown on one page. All the images of a webpage load once when someone visits your website which takes too long to load that webpage, this is the main reason why your website become slow. Lazy Load make a single change which is, It will stop all images from loading in the beginning rather it will load only images which will be displayed on the user screen. As you scroll down, the images will be loaded as well. It will reduce the time which your page normally takes when you were not using Lazy Load. This is very simple loading all images at one time is more time consuming than loading some images from the all which your user can see on screen. Now, I hope you understand, what is Lazy Load? but wondering how you can start using it on your WordPress site? How To Enable Lazy Load In WordPress? 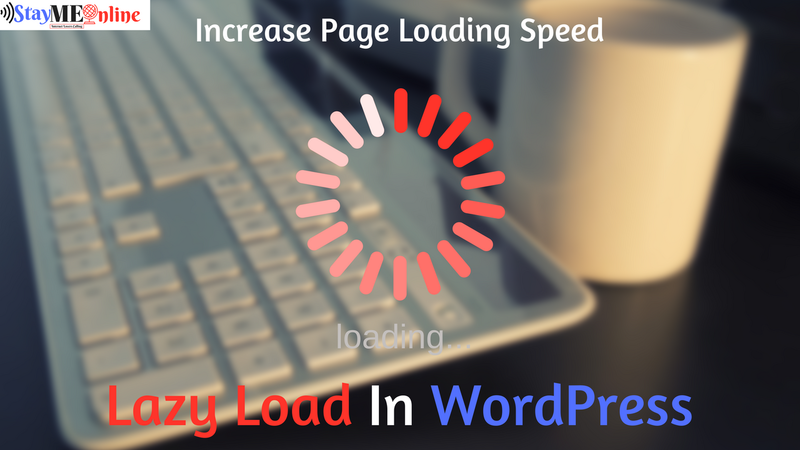 There are many ways which you can pick from to enable the lazy load on your WordPress site. As I always say that WordPress has solutions for everything with their plugins, here applies the same. I am sure you are using WordPress Jetpack plugin on your WordPress site, This one plugin has everything, this is one of the must-have plugins for any WordPress site. Jetpack has many things in the single plugin, It is the must-have plugin for every WordPress site. It also has Lazy Load feature in-built. So, you only need to activate it. You can do this by going Jetpack>Setttings>Writing, Scroll down to the Speed up your site… and Activate the Lazy Load like shown in the below image. You can read a step by step guide on how to enable lazy load using BJ Lazy Load? by clicking here. This is the plugin which I have tested personally and found useful that’s why I am adding it to the list. It has good reviews and rating in the WordPress directory. First Download and Install the plugin by going Plugins>Add New and search for a3 Lazy Load. Here are some more options which you need to look at… If you don’t want to make thumbnails lazy load then you can disable it from here. And many more options are available. You can choose the effect also… There are two effects Spinner and Fade in, You can also choose Loading background colour also. Click on the Save button to make all the changes live on your website. Using Lazy Load can make a high impact on the page loading speed of your website, if you are using CDN then you can still use this and it will not make any impact on CDN. This is done for this post and I hope you liked this and found it helpful if you did then must share it with others to help them too in increasing the speed of their website. If you have any query still then must share them in comments or you can also ask for help in the StayMeOnline Forum.